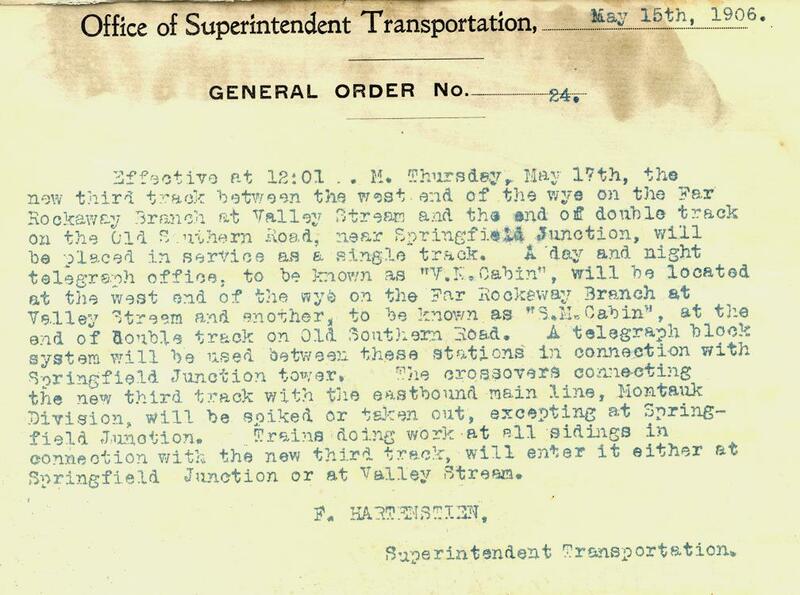 ONE HUNDRED YEARS AGO - MAY 17, 1906 - THE LONG ISLAND RAIL ROAD INSTALLED AN ELECTRIFIED THIRD TRACK BETWEEN SPRINGFIELD JUNCTION AND VALLEY STREAM THEREBY COMPLETING THE ORIGINAL ELECTRIFICATION. TRAIN MOVEMENTS ON THIS TRACK WERE PROTECTED BY A TELEGRAPHIC MANUAL BLOCK WITH TWO TELEGRAPH OFFICES - SM CABIN AT END - OF - DOUBLE - TRACK AND VN CABIN AT THE WEST END OF THE WYE AT VALLEY STREAM. 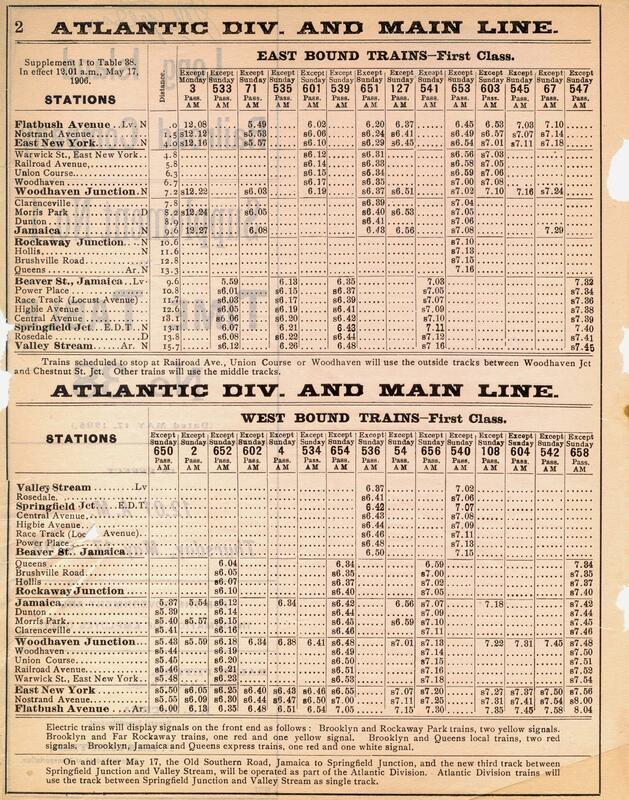 TIME TABLE NUMBER 38 WENT INTO EFFECT AT THE SAME TIME AND MADE THE OLD SOUTHERN ROAD AND THIRD TRACK PART OF THE ATLANTIC DIVISION. LOOKING EAST FROM LAURELTON STATION. IN THE DISTANCE ARE "SM" CABIN AND "E.D.T." END OF DOUBLE TRACK. THESE ARE THE STATIONS SHOWN IN EMPLOYE TIME TABLE NUMBER 38 SUPPLEMENT NUMBER ONE OF MAY 17, 1906. 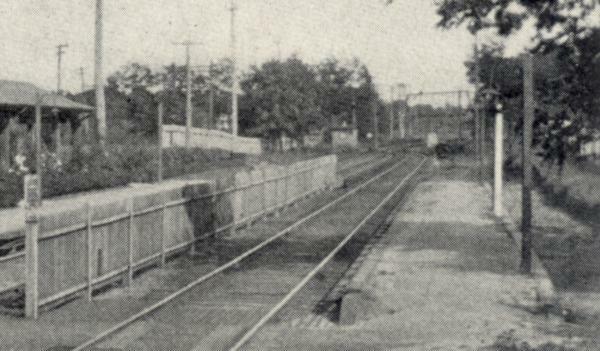 TRAINS ON THE "OLD SOUTHERN ROAD" COULD NOT STOP AT JAMAICA STATION WITHOUT MAKING A REVERSE MOVE AND USED BEAVER STREET STATION - PASSENGERS WALKED TO CONNECTIONS AND THERE MAY HAVE BEEN A FOOT SUBWAY. MOST OF THE VALLEY STREAM TRAINS TERMINATED AT BEAVER STREET.